The late iconic cowboy doctor saved bighorn sheep as well as human lives. James H. “Red” Duke was born in Ennis. Although a few Texas outlaws hail from this town just south of Dallas, none ever achieved the notoriety of Red Duke. After his family moved to Hillsboro, young Red hung out with Willie Nelson, a future country music outlaw from Abbott, but that was the extent of Red Duke’s outlaw career until the 1980s. In fact, he was a model citizen, known for his TV news segments on the latest medical discoveries and his life’s work preserving Texas’ bighorn sheep, as well as his trademark bushy mustache, bolo tie and, you guessed it, wavy red hair. Duke attended Texas A&M University, where he was elected yell leader and became a Ross Volunteer (military drill team and honor guard for the governor of Texas); he later served as an Army lieutenant in a tank battalion stationed in Germany following the Korean War. His Christian upbringing and desire to help people then led him to earn a degree from Southwestern Theological Seminary in Fort Worth after he returned home, but Duke decided he could help people more as a medical doctor. At 31, he received a medical degree from UT Southwestern Medical School in Dallas. As a resident in surgery at Dallas’ Parkland Hospital, Duke was the doctor on duty there the fateful afternoon of Nov. 22, 1963. When Duke heard the call that the president had been shot, he hurried to the emergency room. Duke saw the still body of President John F. Kennedy and heard someone say that a man in the next room needed help. Others were with the president, so Duke went to the other man. Critically wounded Gov. John Connally later credited Duke with saving his life. The two men became close friends and hunting companions. After Texas Gov. 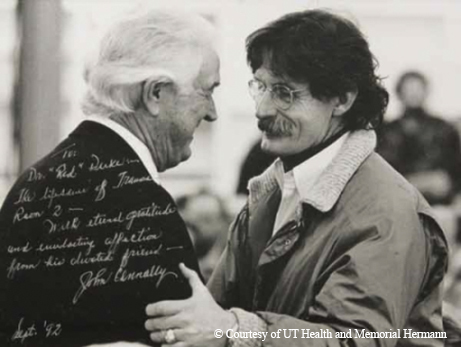 John Connally was critically wounded in the motorcade that took the life of President John F. Kennedy, he was treated by Dr. Red Duke at Parkland Hospital in Dallas. Duke grew up hunting small game, but he turned his sights to big game after marrying Betty Cowden, whose South Texas ranching family hunted. Betty recalls that in spite of a busy schedule, the young doctor always had time for hunting. Their daughter, Sara, grew up with taxidermy on the walls and claimed that the game animal heads were her secret friends. Duke probably chose bighorn hunting because they were the most difficult to hunt. Bighorns were found only in western states, Canada or Mexico at that time. They were extinct in Texas in the 1950s, and restocking attempts did little more than feed mountain lions. Predation stymied success. Then, a chance meeting at a gas pump set a force in motion that would ultimately bring the heavy-horned sheep back to Texas. Jack Kilpatric, a wildlife biologist with the Texas Parks and Wildlife Department in West Texas, had stopped for gas in Marfa when a man at the next pump noticed the TPWD decal on his truck. Tommy Caruthers was there on an antelope hunt and struck up a conversation with Kilpatric about bighorn sheep. Kilpatric, the project leader for bighorns, told him he thought they could bring back the sheep, but the funding wasn’t in the budget for construction of the predator-proof pens that would be needed. Caruthers told him perhaps he and his friends — fellow bighorn hunters — could help, and they soon formed the Texas Bighorn Society (TBS). 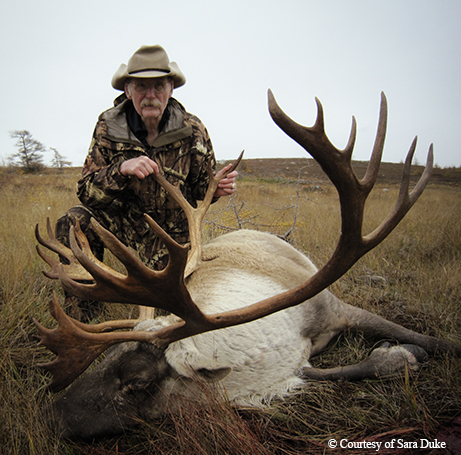 Duke's last big-game hunt, at age 81, was a caribou hunt that had been auctioned off by the Boone and Crockett Club. The new bighorn group, with Duke as its first president, agreed to fund new pens on the Sierra Diablo Wildlife Management Area. Another member, Herman Bennett with Holiday Inn, agreed to underwrite the project. Others active in the formation of TBS were Caruthers, Pat Latham and Harry Tennison. At one of their meetings to discuss funding, the idea was floated to have Dr. Red Duke arrested. Organizations were raising money by a popular, entertaining new method: having alleged perpetrators “arrested” and then requiring them to solicit “bail” money from their friends. Hearing that, Clayton Williams, a prominent oil and gas operator and accomplished sheep hunter, readily announced that he would happily pay $16,000 to see Red Duke go to jail. The plan then took on a life of its own, getting bigger and wilder as it went. When Duke got off the plane in Van Horn, he was arrested and charged with “impersonating a sheep hunter and drawing knives on people” — a fitting charge against a surgeon. After the jailing in Van Horn, the next move was to break Duke out of jail, and that involved a mock gunfight. A gang from Marfa arrived, and roughly half the people of Van Horn were “shot” in the melee. Of course, considering the diminutive Van Horn population at the time, that might not have been very many victims. The survivors hastily carted the accused to Pecos where he was brought before “Judge Roy Bean,” a beer distributor who obligingly portrayed the legendary “Law West of the Pecos” justice of the peace, dispensing make-believe justice from a makeshift “Jersey Lilly Saloon” he owned. Reputed to be a hanging judge, he knew only one sentence. Everybody saddled up and headed to the rodeo arena, the only place in Pecos large enough for a public hanging. Kilpatric led the condemned man’s horse to the gallows. The film of the actual hanging may be lost to history, but the memory of seeing him swing in the video is still haunting 33 years later. Red Duke had been willing to die for conservation. It looked like he had. 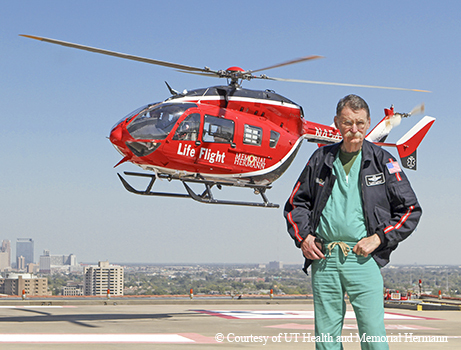 Dr. Red Duke founded the Life Flight air ambulance service at Houston's Hermann Hospital in 1976. It has now flown more than 140,000 missions. But it was all Hollywood, including the “hanging harness” rented from the movie industry to keep him safe while making it look real. Duke probably enjoyed it as much as anybody — the star of his own necktie party. Bighorn sheep restoration was that important to him. As the founding leader of TBS, he was the face of the species’ reintroduction into the Texas wild. Untold money was raised and countless hours of volunteer work were spent constructing sheep pens, water guzzlers and anything else the bighorns needed. Success was slow but steady. From the scant few sheep that survived predation, plus other acquisitions and recruitment, Texas bighorn numbers have grown to around 1,300. Limited hunting of bighorns is allowed and strictly monitored. The 1983 “hanging” is not widely known except to those involved and a few others. More people are familiar with the thin, scruffy-faced man with a horseshoe mustache wearing a white lab coat, speaking in a distinctive Texas twang, who gave health tips after the news. He looked more like a country doctor than the spokesman for one of the largest, most prestigious medical complexes in America. But Red Duke was much more than a mere talking mustache on TV. He became a folk hero. A television series starring Dennis Weaver was based on Duke’s medical and conservation innovations. Biographers will note that Duke founded the state’s first air ambulance service and Hermann Hospital’s first trauma center, later named for him. He was president of the hunter/conservationist Boone and Crockett Club, and an elementary school in the Houston area bears his name. Duke never retired, practicing medicine and teaching at UT Health until his death on Aug. 25, 2015, at the age of 86. He is buried in the Texas State Cemetery. “I have gone back and watched videos of him to find motivation to give my job my all,” a recent medical school graduate told me. Especially, he added, ones about how he treated his patients. Even though Duke is gone, Texas medical patients and bighorn populations will continue to benefit from the good doctor’s unfaltering care and commitment.